When someone starts to kill his beautiful patients, plastic surgeon Larry Roberts becomes suspicious and starts to investigate. For a somewhat early effort from science fiction giant Michael Crichton, we visit 1981�s Looker. Hotshot plastic surgeon Dr. Larry Roberts (Albert Finney) works on the rich and mighty as well as insecure actresses who desire physical perfection. In the latter category fits Lisa Convey (Terri Welles), a blonde bombshell who comes in with a list of miniscule modifications. While she waits for a date to arrive, a mysterious creep (Tim Rossovich) enters her apartment and creates a situation that causes her to plummet off of her balcony. When another patient of Roberts� also ends up deceased, police Lt. Masters (Dorian Harewood) chats with the doctor. He implies the cops suspect Roberts, and we quickly surmise someone�s attempting to frame the doctor. Matters get even weirder when patients start to worry that they�re too physically perfect and that�s what�s getting these women killed, and Roberts finds himself implicated in another murder. In an attempt to dig into connections among the dead women, Roberts pursues another of his clients: Cindy Fairmont (Susan Dey). She�s been involved with a group called Digital Matrix, and they seem suspicious to Roberts. The rest of the movie follows their pairing and attempts to solve the mystery while they also stay alive. Back in 1981, Looker was a movie on the technological edge, as its science fiction seemed far-fetched. It proved surprisingly prescient, however, as many of its seemingly ludicrous concepts have become fact in the last 35-plus years. We can see a lot of modern concepts on display in this effort. This means that the film appears dated and timely all at once. To my surprise, the technology displayed doesn�t age the movie as much as I�d expect. Sure, the computer material looks quaint, but it�s not the distraction I�d anticipate. The general early Eighties feel of the flick is a different matter, though, as it can create some distance between the viewer and the story. It just becomes hard to accept such technical sophistication in a world like this. Nonetheless, Looker deserves credit as a film that anticipated trends in computer visuals as well as plastic surgery. Does that mean it soars as a film? No, for while it entertains in a rudimentary way, it remains more memorable as a piece of scientific prediction than as an actual movie. Many of the problems stem from the coherence of the story. To say the least, the tale doesn�t flow particularly well. Looker jumps around with abandon and never manages to mesh together in a concise manner. Some devices feel tacked on and pointless, while others appear with too convenient to make sense. The general ambition of the story never coalesces either. The film hints at sinister motives for the computer technology but never delivers on them. It can�t decide if it wants to turn into a scary thriller or if it prefers to be a basic mystery tale. These elements balance awkwardly and don�t come together in a satisfactory way. This means we just wait and wait until the inevitable ending. Without question, Looker comes with a predictable conclusion, and it doesn�t make the ride to get there especially memorable. Looker offers a moderately intriguing tale with just enough panache to keep us occupied. It can�t do more than that, unfortunately. Trivia note: if you look closely, you�ll find Vanna White in the flick as an extra. Looker appears in an aspect ratio of approximately 2.40:1 on this Blu-ray Disc. Because I have faith in Warner Archives, I suspect the image replicated the source, but nonetheless, the end result seemed surprisingly unattractive. Sharpness felt unexceptional, as much of the image appeared somewhat soft and ill-defined. Shots didn�t look terribly �off�, but they rarely showed particularly strong delineation. I noticed no jagged edges or moir� effects, and I witnessed no edge haloes. Source flaws stayed absent, but this became one of the grainiest films I�ve watched in a long time. Even daylight exteriors showed prominent grain, and this became a distraction. Colors were bland. The movie opted for a fairly blue feel, and the gues seemed lackluster, without a lot of clarity or vividness. Blacks were reasonably dark and dense, while shadows showed decent delineation. Again, the image may have reproduced the source, but it nonetheless didn�t look very good objectively. Not a lot of ambition came from the movie�s DTS-HD MA stereo soundfield. The movie opened up ambience and music to a reasonable degree and gave us good spread across the front. Not much of distinction cropped up, though, so the soundscape failed to do a lot. Audio quality seemed good for its age. Speech showed no edginess or other problems as the lines remained natural and crisp. Music was smooth and bright, while effects appeared acceptably concise. A little distortion crept into some louder bits but most of the material stayed clean. While the audio never excelled, it seemed fine for the flick. How did the Blu-ray compare to the original DVD from 2007? Audio differed in that the DVD opted for a surround track. However, because that one barely used the rear speakers, the scope of the soundscape remained similar. The lossless Blu-ray mix offered a bit more range, but the restrictions of the source held back potential improvements. In terms of visuals, the Blu-ray showed superior colors and accuracy, and it also cleaned up minor print flaws. Ironically, the higher resolution of the Blu-ray made the restrictions of the original photography more obvious. Still, even with my misgivings about the image, the Blu-ray fared better than the DVD. 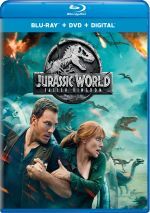 The disc includes an optional introduction by writer/director Michael Crichton. In this four-minute, 43-second clip, he provides a little background about the flick and its creation. This acts as a nice little opener to the experience. Next we get an audio commentary with Crichton, as he offers a running, screen-specific chat. He gets into the project�s origins and its development, cast and performances, sets and locations, visual effects, reactions to the film, and technical topics. While Crichton never makes this a fascinating commentary, he does his job. He gives us a pretty solid review of the appropriate issues and avoids the standard pitfalls like too much dead air or praise. Crichton digs into his movie with reasonable depth and turns this into an enjoyable chat. In addition to the film�s trailer, we find one deleted scene. It runs eight minutes, 14 seconds and comes from parts of the movie�s climax. The scene offers more exposition about the villain�s motives as well as some additional action. On its own, it works fine, but I think it would�ve felt redundant in the final cut, as we don�t really need the information it provides. More than 35 years after its initial release, Looker seems remarkably prescient in the way it predicted various trends. However, as a film it never seems remarkable in the least, as it offers an uninspired thriller with little to spark the imagination. The Blu-ray provides erratic visuals along with decent audio and a few useful bonus features. Looker boasts promise but falls short of its goals.